You are wondering about the best software you should install on your PC. You want your PC to be installed with useful software that can help you with whatever task you want to perform. The best software is the ones that work and offer comprehensive features. Many of the software are completely free or they come with a trial that allows you to test it for a few days. The following are the top 4 software to install in your PC in 2018. VLC Media Player is a must have media player for movie and audio play back in every Windows PC. It supports an extensive selection of media files including DivX, MPEG, MP3, and AAC. If you have some movies in a zip folder, you can open it directly on the media player. It will automatically play one after another movie from the zip folder. It allows you to increase the volume of the movie up to 200%. Its function can be expanded through plugins. Recuva is a data recovery software useful for recovering files that you have accidentally deleted. It can create an image file of the disk that you are trying to recover. This makes it convenient for you to recover files from a failing disk. To start recovering files, you must go through a wizard that ask you questions like type of file to restore, and which folders to look in. You can choose to have a quick scan or deep scan done. Quick scan is faster but it is most likely to miss the file you are looking for. Deep scan is longer but is can efficiently retrieve every file that you have deleted recently. It will display all the recoverable files in the window as it retrieves them one by one. MalwareBytes is an anti malware program that can scan all the processes on the PC for malware in less than 3 minutes. You can perform a scan by clicking the Scan button manually. It lists all the suspicious items and offers you the option of setting a quarantine. You can go back to the History tab to restore them if you accidentally delete items in the quarantine. It can remove any adware or toolbar that is installed on your browser. 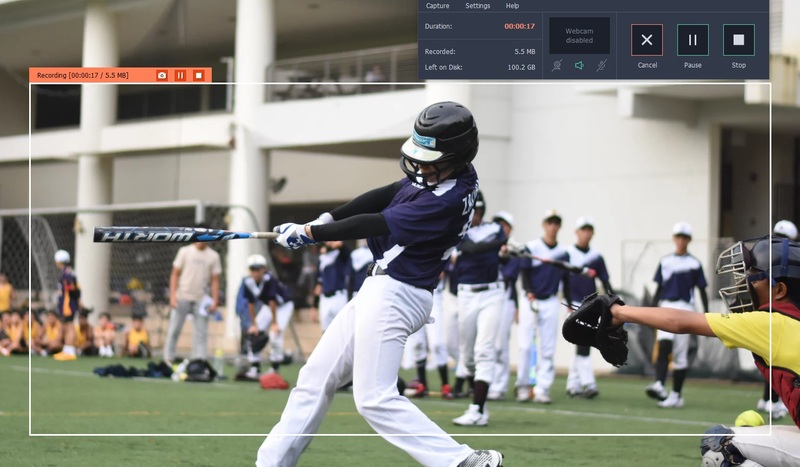 Movavi Screen Capture Studio allows you to capture your screen for various purposes including recording software walkthrough, tutorials, online video streaming, Skype calls, and video gameplay. When you first launch the screen recorder , it will display a crosshair symbol cursor. With the crosshair cursor, you must draw the recording frame on the area of the screen that you want to capture. There is a full range of screen capturing presets in the drop down menu on the small control panel. You can plug in your microphone and speakers to capture sound from them. There is a volume slider beside the microphone and speaker features that allows you to adjust the sound volume that is recorded during screen capturing. If you enable the webcam feature, you will be able to see your face on the lower right corner. The webcam feature is great for people who want to explain about what they are recording on the screen. The orange REC button is the button to press whenever you feel that you are ready to start the screen recording. During recording, it will display all the necessary information such as recorded disk space, left on disk and duration. You will be able to see the cancel, pause and stop button on the control panel and on the top left corner of the screen recording frame. Pressing the stop button will halt the screen recording. It takes you to another screen where you can decide which part of the video you want to keep. You can open the screen recording in the Movavi video editor and edit it. The editor offers features such as crop, resize, arrows, lines, frames and highlight.